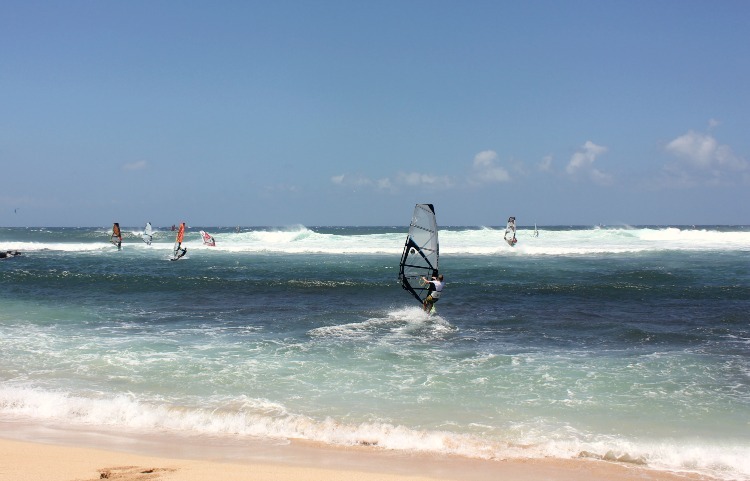 With the right winds, local windsurfers had arrived to take advantage of the weather. The surfers were waiting for the afternoon tides to change, the stand up paddlers had headed out of the zone to gain some shelter along the cliff, so it was all about the windsurfing. As I watched each one of them descend to the edge of the sea, they were soon gliding across the water. Despite the strong wind and taking a moment to adjust to the wind, it seemed effortless, although I knew it took a balance of skill, know-how and strength to handle the combination of Mother Nature’s creations. The windsurfers resembled butterflies to me -colourful wings that seemed to sit on the waves like the way butterflies momentarily will rest on a leaf. Its a quick moment and then they’re off on the wave, moving at a fast clip. I was lucky enough to get some close up shots of windsurfers going in and coming back to shore, but this image of them floating on the sea was my moment of considering them just a part of Mother Nature like a butterfly.